2-Condo's both 2 Bedrooms, 2 Baths, (Sleeps 2-4) right across from each other. 2 Condo's to choose from, right next door to each other, Great for 2 families in case you have more in your party we can book this one for you as well. To start your day, its a 5 minute walk, to Creole or Quitten Time Ski runs, Ski down or hike or bike & your at the bottom of the Town Lift where you can pick up your ski pass's & grab the lift up to the top or have a nice lunch in one of the many restaurants in Old Town Park City... or take your mountain bike up the lift and bike down. Minutes from Historic Main Street ,Restaurants, Coffee Shops, Museums, Shopping, Night life & Art Galleries and more. Or stay in, and enjoy the fully equipped kitchen, or BBQ out on the deck, take a Hot Tub, Light a fire & watch a movie. Nice comfy beds, New Flat Screens in bedrooms, Fluffy Towels & Toiletries, soaps & lotions, shampoo & conditioner's, Hair Dryers. Our 2 condo's have Park City Mtn right behind us, beautiful views of mountains, Skiing & Biking, Hiking right outside our door. The master contains a King Bed with Luxury Linen's, and Fluffy Robes, New Flat Screen TV. Bedroom 2 contains a Queen Bed with Luxury Linen's, New Flat Screen TV. Both bathrooms have shower and 1 tub in master, with beautiful natural travertine stone. Soaps, Lotions, Shampoo's & Conditioner's, Hair Dryers, everything you need already here. Head down to Main Street for yummy restaurants, clubs, coffee shops, deli's, and boutique shopping, also a 5 min walk. A free trolley will take you up and down our cute little Main Street. The Bus Stop is a 5 minute walk, down the hill on Park Ave, Old Town, which will take you all over Park City. The condo's have a full kitchen with all the extra's, coffee, tea's, sugar & spice's, oils & vinegar's to help you enjoy yourselves. We supply more then the average rental. Purified water softener, a nice barbeque out on the deck, facing the snow covered park city mountains or the Green Lush Mountains behind us. World Class Skiing, Snowshoeing, Sledding, Biking & Hiking right out the door, not far we have cross-country skiing, tubing, ice-skating, tennis, golf, movies, a new Bowling Alley, the Factory Outlet Stores, just in case you want to go shopping, and lots of other great stores up and down Main Streets Old Town of Park City. All just a few steps away! VAIL, has just bought PCMR, so now you can ski Canyons with your Epic Pass. Park City Mtn Resort & the Canyons are now connected so you can ski over to the Canyon's from Park City Resort. The skiing is incredible, we highly recommend skiing over to the Canyon's, lots of new fun long runs & terrain to explore. Just take the Gondola over the top & your in the Canyons. Great spot for Lunch is the Lookout Cabin, you will need reservation's. Nice sit down lunch with nice wine list & cocktails. Keywords: Condo, Near High West Distillery on Main Street. We've been in Park City since 1988, Lived all over town & found the condo ( little secret spot) in 2000. Whats so special about it is that its the location, just right outside the door you can walk to Main Street in 5 min's. The best part is that its nice & quiet up there & the hiking & ski trails are also right outside the door to enjoy. We live & work here so were lucky to still be able to enjoy it. We'd be more then happy to give you any tips on fun things to do here. We love this location of Park City, its a great place if you like the outdoors. Its close to Main Street, so you can go for a walk down to get a bite to eat or take a stroll. Listen to live music, at some of our great clubs. Hiking Trails right outside our door, great for hiking, biking, & exploring. For Skiing, you head out the door & your on the ski hill in 3 min's, on the way home you get to ski to the driveway!! Awesome!! Lots of wildlife, deer, moose, fox, & variety of birds up there too, really makes you feel like your in the woods. Our condo's are right up against Park City Mountain Resort, I can ski to my driveway! Ski down to the Town Lift in 3 minutes. In the summer I hike right out my door or mountain bike up the single tracks to the top of Park City Mountain, & to Old Town, no need for a car. Its also very quiet and peaceful up there, not a busy street. Sometimes we can spot a wondering Moose or Deer. Close to everything, yet away from the hustle and bustle, nice and relaxing if you want. 5 minute walk to Old Town, and Town Bus.. Beautiful & lots of snow up here!! Condo's are loaded with all top of the line amenities to make your stay extra special. We supply more then the average rental, and provide tender loving care. Both Bath's have been newly remodeled with Travertine Stone, new fixture's, & nice fluffy towels, lots of extra's in bath. 5 minute walk down to Old Town Park CIty, where lots of Restaurants & Shops, Art Galleries, and free Bus system that can take you all over town. Right out our window is Park City Mountain Resort's Ski Hill's. A great place to take a nice walk or hit the trails, for Skiing, Hiking, Biking or Wildlife spotting. 5 Min to Main St.
Nice & Quiet area, See wandering Deer & Moose out the back door. Away from hustle & bustle of Main Street Old Town, Lots of Parking, 2 spots for you. 5 Minute walk to Historic Old Town, Park City, 5 min's to Golf Course, Grocery Store, Movie Theater, other yummy restaurants off of Main Street. Living room faces old town and park city mountains. Were backed up to Park City Mtn. Resort Ski Hill, Creole & Quiten Time Runs, which bring you back down to the condo right to the driveway. Ski right to the driveway from Park city Mountain Resort. Ski down Payday to Old Town, Ski down Creole Gultch or Quitten Time to get back to condo right to the driveway. Put the fire on & Relax. A short walk to the ski slope, which takes you down to the Town Lift of Park City Mountain Resort, Click your ski's on & ski down to Town Lift and head up to Mid Mountain at Park City Mtn. Resort. Luxury linens, towels, pillows, & robes. Brand new HD Washer & Dryer in condo, with laundry soaps etc. Nice Bright Living room with incredible views. Oil's & Vinigar's, lots of spices too! 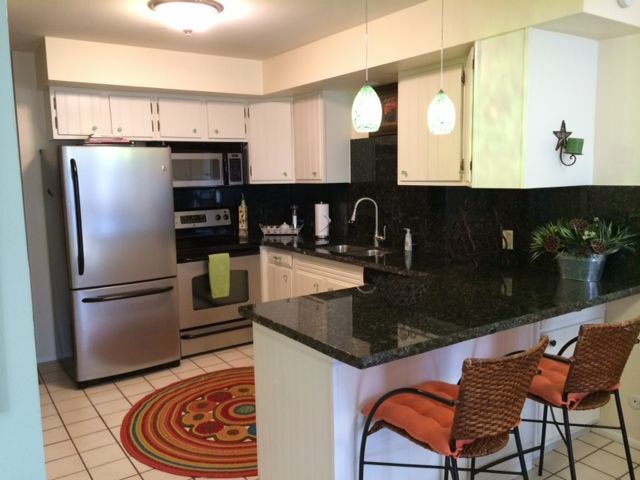 New stainless steal appliances, granite, fully equipped kitchen, with lot's of extra's. Brand New Water Softner put in this year. Lots of extra's in pantry for helping you prepare meals, coffee,tea. Outside deck with table & chairs. New 46 in' Flat Screen, with Blue ray, I-pod docking. Video Library, New TV's in bedrooms too! Boardgames for the kids, & adults. Latest movies, and some for the kids. Park City Mountain right behind my house, Lots of hiking & ski trails to explore. 2 Minute walk to rent bikes. Park City Raquet Club, lots of public courts all around town. Park City Golf, Wasatch Golf, Mtn. Dell Golf, Park Meadow's, Glenwild, Jeremy, Victory Range, Promentory, lots of Courses to choose from. Brand New 8-10 person Hot Tub, surrounded by big pine trees. Thank you, hope to hear from you again!! We had a wonderful time-plenty of space for the four of us. Great walk to town-we went each night. Skiing was excellent-a few minute walk up the hill and then ski right down to the town lift and easy ski home. We would definitely stay here again! Awesome place and location! Leslie was very communicative. Thank you!! Thank You, Glad you enjoyed yourselves, hope to hear from you again!!! Condo was in a great location to get to everywhere. And we did it without a car! Skied to Town Lift and made our way across most of the peaks at PC and Canyons. Easy bus ride to Deer Valley for another day of skiing. Short walk to Park and Main for food and shopping. Used a grocery delivery service to stock up - glad we did. Thin air and steep slope would have made carrying groceries a tough chore. Looking forward to our return trip already. Thank you!! Glad you enjoyed the condo & location... if your athletic & adventurous or just like to sit by the fire & watch the snow fall, it’s hard to beat, we love it there... Nice & peaceful but so close to everything. So glad you enjoyed the condo & location, we look forward to your next visit.. Hope to hear from you again. Charming, great condo, great location, well appointed. Awesome ski getaway. Super convenient ski in and close to historic park city. Thank you for the Nice review, so glad you had a fun trip!! Very nice. Clean. Well stocked. Close to town lift and Main Street. Comfortable 2 bedroom condo. Nice fireplace. Nice sunrise views. Walking distance to ski rental, lift and restaurants. Covered parking is nice. Nice & Peaceful, close to Ski Run, Trails, Town, Bus Stops, Main Street Historic Old Town, This is why we picked this location. Were up in the woods, very quiet. You can walk to town down the street or ski slope, hiking trails, or sled down to town to enjoy Park City's great Main Street, only takes 5 min's. Enjoy Shops, Restaurants, Art Galleries, & Night Life. Rates Depend On Time of Year, for All season's rates do vary, Very flexible with pricing. My condo is a 5 min walk to Main Street (Old Town Park City) Great Location, quite spot against Park City Mtn. Resort. Lots of great extra's in condo to make it very comfy & convenient for you. We live in town, so always upgrading... Check In is 3:00 Check Out is 10:00 Am Rates start at 150.00 a night, depending on time of year.